TWO MDC Alliance MPs and 16 other people appeared at the Gweru magistrates’ court yesterday and were denied bail on charges of inciting and participating in public violence. Amos Chibaya, the MDC Alliance organising secretary who is the MP for Mkoba, Livingstone Chiminya, the opposition party’s Chiwundura MP who is also the Midlands provincial youth chairperson and 16 other people were arrested over the violence that led to the looting of shops and bars in Gweru on Tuesday. Chibaya and five other people appeared before provincial magistrate Ms Charity Maphosa while Chiminya and 11 others appeared before regional magistrate Mrs Phathekile Msipa. Chibaya and Chiminya are facing one count each of inciting violence while the other people who appeared before the two magistrates including Titus Chumunya, Bongani Sibanda, Message Nerongo, Lazurus Matariro, Mavis Chakunga, Brenda Madzire are facing a count each of public violence. Chibaya’s lawyer Mr Reginald Chidawanyika made an application for bail pending trial which was opposed by the State. In her bail application ruling, Ms Maphosa said the country and Gweru in particular had not yet returned to normalcy. She remanded Chibaya in custody to today for trial while the other five were remanded in custody to January 22. 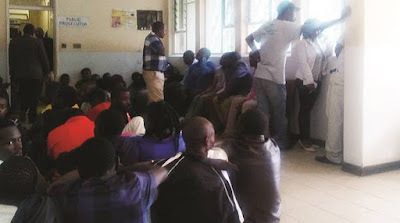 “The accused person after allegedly addressing the youths drove them to areas where they committed acts of public violence and therefore the accused is remanded in custody to tomorrow (today) for trial,” she said. On the other hand Mrs Msipa also denied Chiminya bail after an application by the accused lawyer Mr Brian Dube. She said she was going to deal with the bail application for the other people today. “The environment is still volatile, you are alleged to have incited people in Gweru to participate in criminal activities and things are not yet 100 percent normal. Releasing him is not in the best interest of the public. We need to protect the people from such acts. The public will lose confidence in the judiciary and bail is denied,” she said.